IBIZA DETECTIVES. PRIVATE INVESTIGATORS IBIZA. Omnia Veritas, private investigators, has grown to the point of being able to provide service throughout the country with the same level of quality and reliability that has enabled us to achieve a growing reputation all over the main cities in the country. Our dealings with the client and our perfectionism when translating our investigations into investigation reports has led us to achieve a growing client portfolio, which we would like you to join shortly. Hire a modern and efficient private detective service focused on meeting your needs for information and evidence with absolute respect for the law. You have the guarantee of years of experience and the certainty of having our professional and personal commitment to solve your problems, whether simple or complicated, with the utmost effort and dedication. If your partner resides in or regularly travels to Ibiza, with friends or on business trips, our private investigators can inform you of all their movements in the area: places they visit, timetables and the company they frequent. With this information, true and evidenced by numerous videos and photos, you can find out if their behaviour is appropriate. Stop suffering thinking about what might be happening; verify it in a precise and professional way. Our team of detectives in Ibiza will keep you informed of the situation in every detail. In recent years the number of people hiding in places like Cap Martinet, Talamanca, Marina Botafoch, Roca Llisa, Cala Conta or Cala Tarida and other tourist areas in Ibiza, where the large number of foreigners, both residents and visitors, makes them go unnoticed, has grown alarmingly. If the person you are looking for is in Ibiza, our team of private detectives will find them and provide you with evidence of their place of residence. 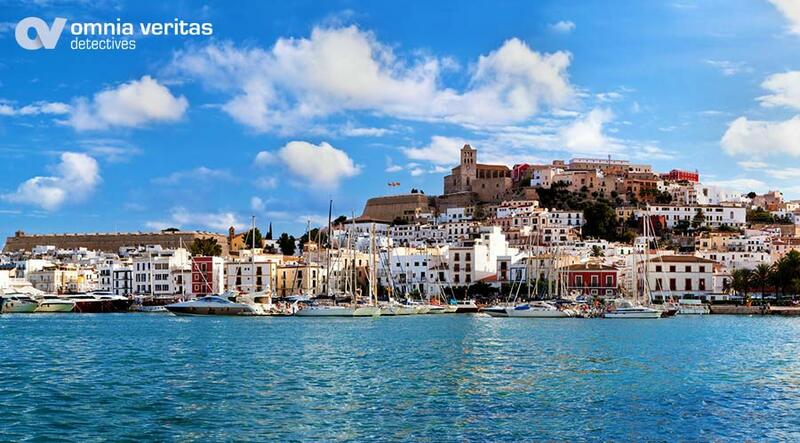 If your partners, suppliers or clients are in Ibiza we can offer you the information you need for decision-making. Our team of private investigators and mystery shoppers will provide you with the information from the site. Do not rely blindly on the information you are given; double check it with our investigation service. If you want accurate information, hire Omnia Veritas. Our team of detectives is reliable and efficient and our sales team will serve you personally, 24 hours a day, before and during the investigation.